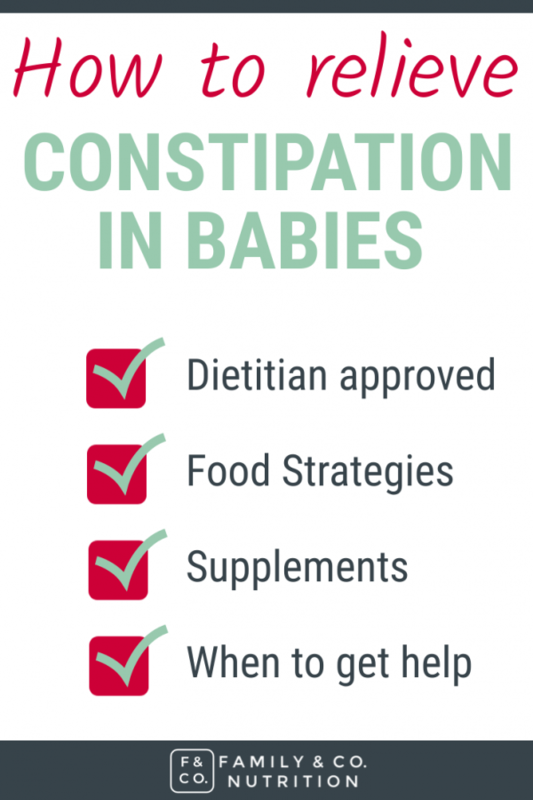 As dietitians working with new parents and babies, constipation in babies starting solid foods is a concern we often hear. A lot of changes happen as more foods are going in! 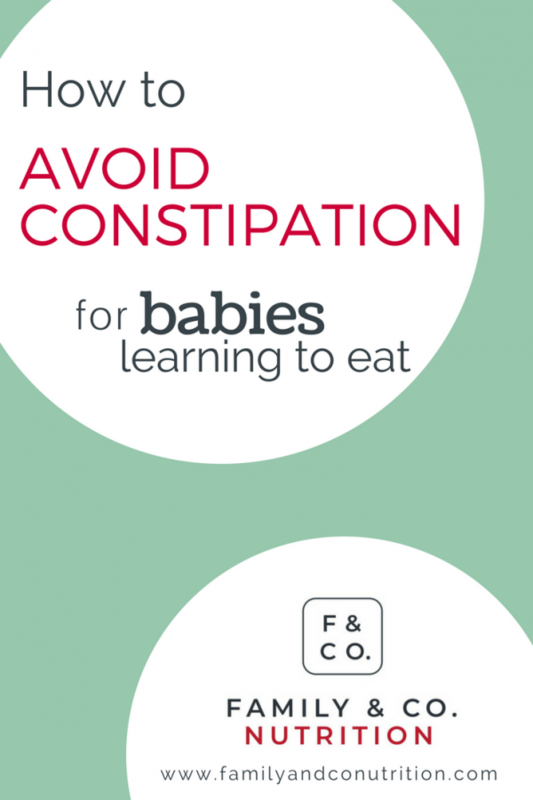 Although that’s good news, it can be worrisome for some parents to see their baby constipated. Constipation is rarely an issue for exclusively milk fed infants, be it breastmilk or formula. If that’s your baby’s case, we recommend that you go see your doctor. It can be a sign of a medical condition, or an intolerance to something passing through your breastmilk, or in the infant formula. There are strategies to avoid constipation in milk fed babies and your health care practitioner will guide you. A lot changes when baby starts solid foods! It is normal to see important changes in poop once we introduce solid foods: colour, odour, amount, frequency… We sometimes see whole chunks of food in the diaper (don’t worry!). This is all part of your baby’s digestive system “learning” and adapting to eating whole foods! When you feed baby only milk, it is normal that they poop once or more per day. There isn’t a lot to break down, digest, and process in liquid food like milk. Introducing solid means baby is getting whole foods, with their fibres (even if it is puréed), which will require more digestion. On top of that, baby’s intestines are now more mature, and better at forming an actual stool (compacting the stool matter and reabsorbing water so that the stool is better formed). All of these changes can lead toless frequentbowel movements. Once a day, or skipping days can be normal for your baby. The transition period from receiving only milk to eating mostly solid foods will lead to all sorts of changes. We talk about constipation if bowel movements are dry, hard and difficult to pass. It is not necessarily defined in terms of frequency. Your doctor would make a complete assessment to diagnose constipation, but you can look out for early signs of constipation. A constipated baby will have hard and dry stool that are painful to pass. 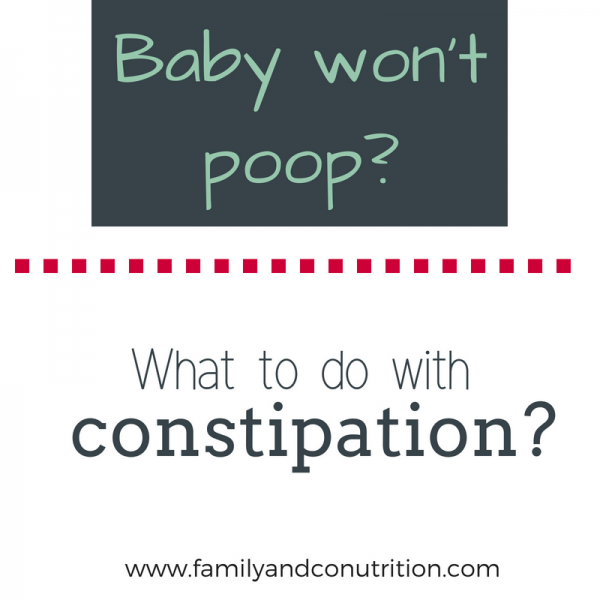 How do I know my baby is constipated? A constipated baby can cry and be cranky when passing a stool. Sometimes, baby will draw his/her legs up when having a bowel movement. Keep an eye for anything that seems unusual for your baby. So, if you baby hasn’t pooped in 3 days, it doesn’t necessarily mean it’s because of constipatation. As with anything, you will get to know your baby and their poop routine. But stay vigilant and reach out to your health care practitioner if any of the following tips don’t improve the situation. 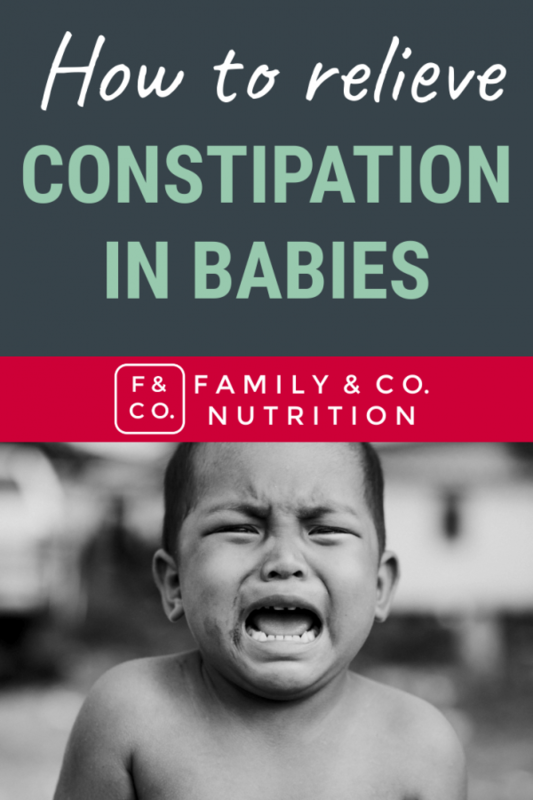 Constipated babies may cry and seems uncomfortable when passing a stool. No need to wait for “real” constipation to take action! Fibres and fluid are going to help your baby’s digestion. As you continue offering breastmilk/formula in between meals, you can also start offering water. We suggest to offer sips of water from an open cup with every meal. It will teach your child some drinking skills, and ensure that your baby drinks enough fluids to help digest the fibres found in whole foods. 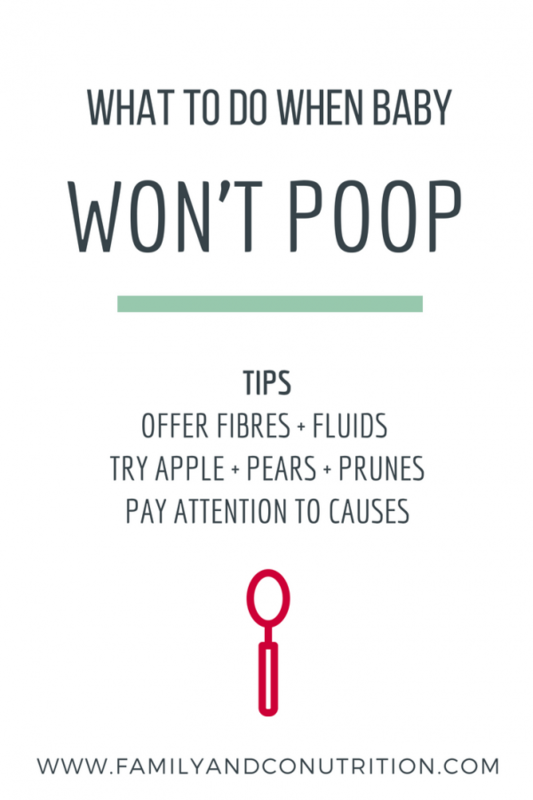 Fibres and fluids are your baby’s weapons to prevent constipation! 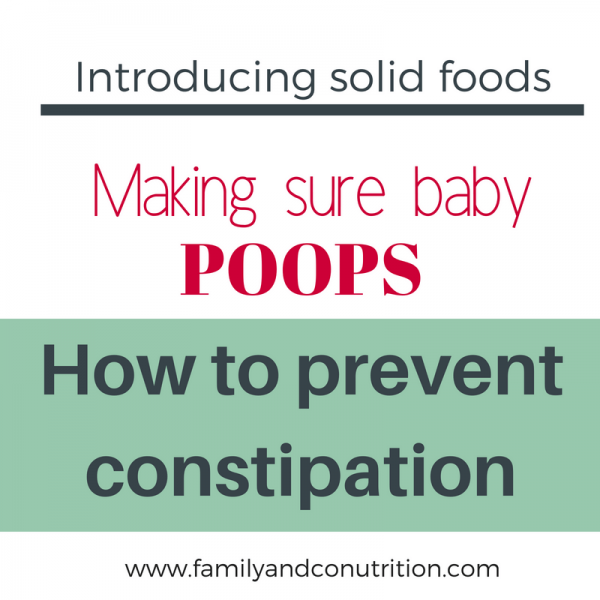 What to feed your baby to minimize constipation? Iron: food sources + supplements. The first food introduced to baby should be rich in iron. It’s an important nutrient, and one of the reasons for introducing solid food, to complement milk around 6 months of age! If you’re feeding iron-enriched infant cereals, you might find that your baby is sensitive to it and experiences constipation. One suggestion is to vary the food sources of iron: meat, fish, eggs, nut butter, beans, legumes, tofu… (and infant cereals). If your baby is taking an iron supplement, talk to your doctor about potentially lowering the dose, and be sure to discuss the pros and cons of continuing to take the supplement. You will have to make some adjustments to ensure that your baby receives enough iron while avoiding constipation. While iron-rich food is important, fruits and veggies should also be part of a balanced meal for your baby. Fruits and veggies are full of vitamin C, which helps with the absorption of iron. They also provide helpful fibres to prevent constipation. Fibres are essential to help form the stool in the digestive tract. All of these are great food to introduce because, yes, they are good sources of fibres, but mostly because they taste good, they are nutritious, they make for a varied diet, and baby will love them! Continue to offer breastmilk or formula, and introduce water with meals. It will help get things moving while teaching your child to drink from an open cup. We recommend to introduce cows milk (or alternative milks) at around 9 months of age, so stick to breastmilk/formula during the transition between exclusively milk fed and established solid foods intake. The fluid baby drinks ensures that their stool isnt’ too dry, which makes it easier to pass. Both apples and pears contain types of fibre that will help the stool to soften, by drawing the water into it. It will make it easier to pass out. Offer these fruits grated (with the skin) to your baby, or purée the whole fruit and offer it with a spoon, or spread it on crackers. Puréed prunes, and prune juice are well known for their laxative effects due to a high content of fiber, sorbitol, and fructose. They can help with occasional constipation. The laxative effects of prunes can be quite potent for a baby’s maturing digestive system, so offer it in moderation. If your baby needs daily prune juice to avoid constipation, consider talking to your doctor or registered dietitian. 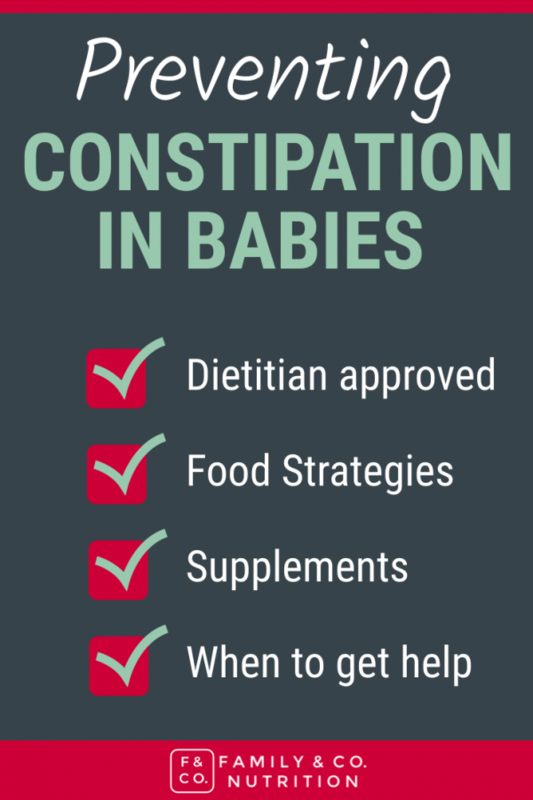 What foods to avoid for constipated babies? 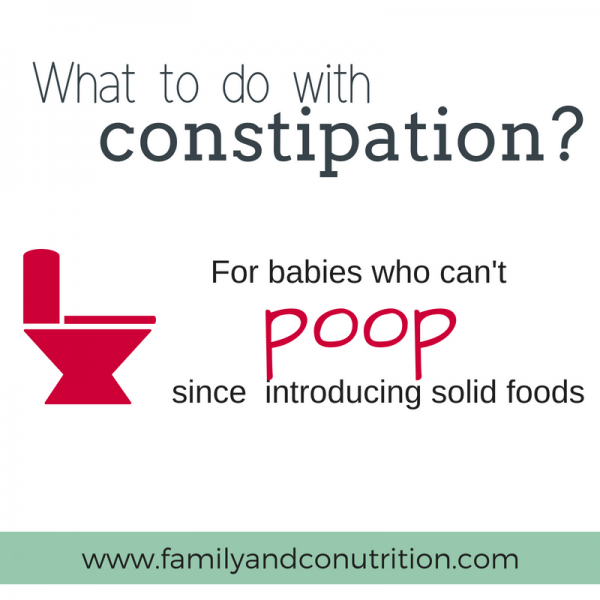 When you notice early signs of constipation, think back about what you fed your baby before. Any new foods? Or perhaps the same food item that seems to always lead to constipation? 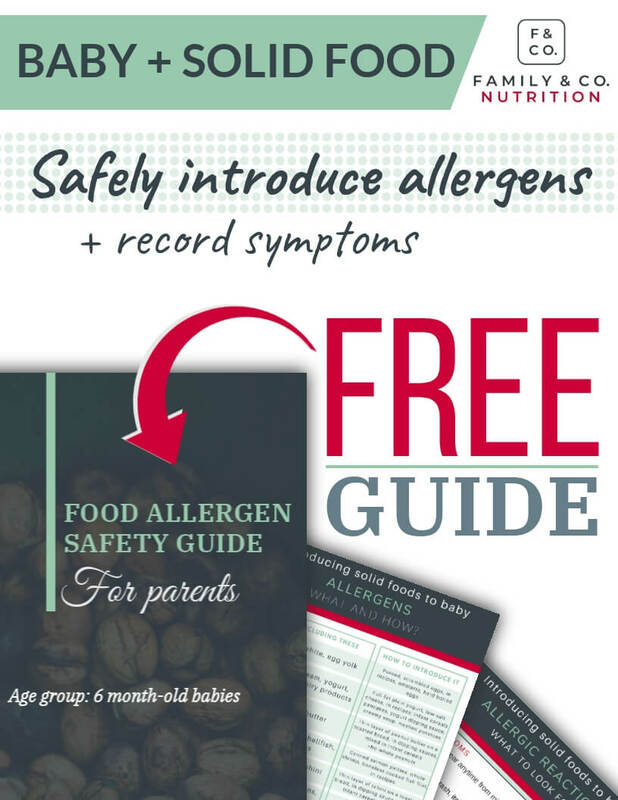 Although it might be nothing, it might also be a sign that your child is more sensitive to that food in particular. Avoid feeding it until the constipation clears up. Try re-offering it while being on the look-out for constipation at a later time. If you do feel that a particular for is the culprit, talk to your doctor about it. Also, consider chatting with a registered dietitian. 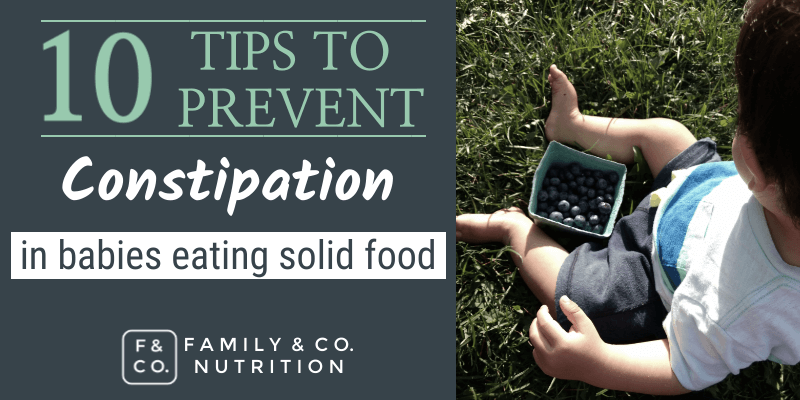 Some babies are more sensitive and can experience constipation when eating specific foods. 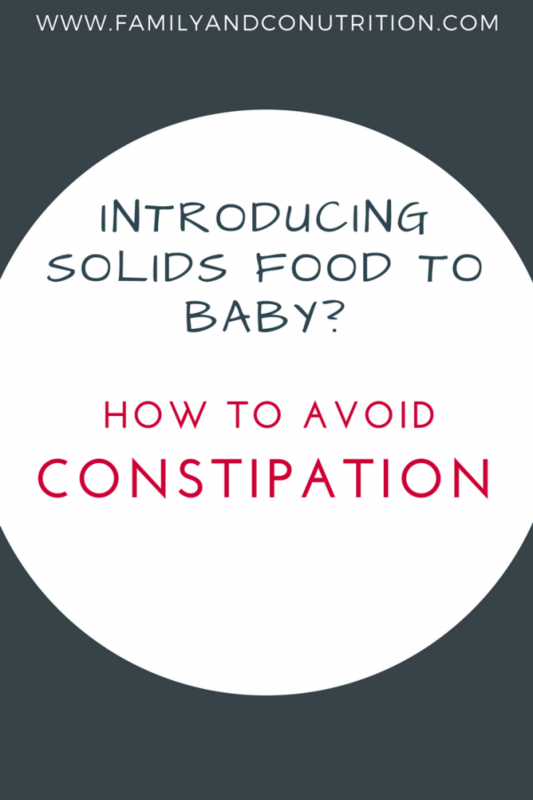 What else should I know about constipation for babies eating solids? Avoid feeding your baby fibre powder (bulking powder) like Metamucil™ or protein powder containing fibre. These are not meant for young babies. They may also get your baby too full to eat any real foods or milk. You can try moving your baby’s legs in a bicycle movement. If your baby is at that stage, let her craw or walk. The science surrounding gut microbiota (all of the bacteria in your gut) is very, very young. Effects of probiotics on the digestion are not fully understood. Some effects might include changing the environment in the gut to favor the formation and passing of stool. Studies suggest that specific types of probiotics like Bifidobacteria and Lactobacilli could help in the treatment of constipation. For infants, Lactobacillus reuteri has been observed in a high quality study of constipated formula-fed infants to help with bowel frequency. 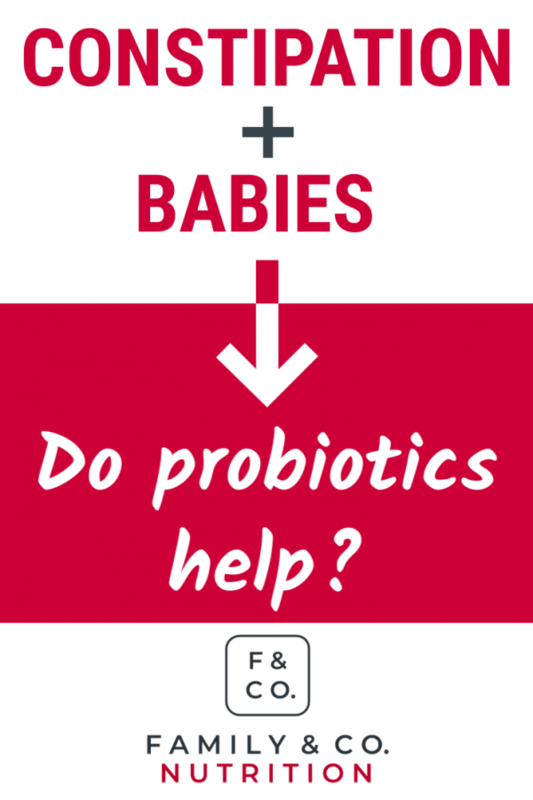 It is interesting, but more studies are needed to replicate the findings and see the impact of Lactobacillus reuteri supplements in infants of various ages, who are either fed breastmilk and/or solids. The North American Society for Pediatric Gastroenterology, Hepatology, and Nutrition (NASPGHAN) and European Society for Paediatric Gastroenterology, Hepatology and Nutrition (ESPGHAN) has conducted a thorough review of the current research. 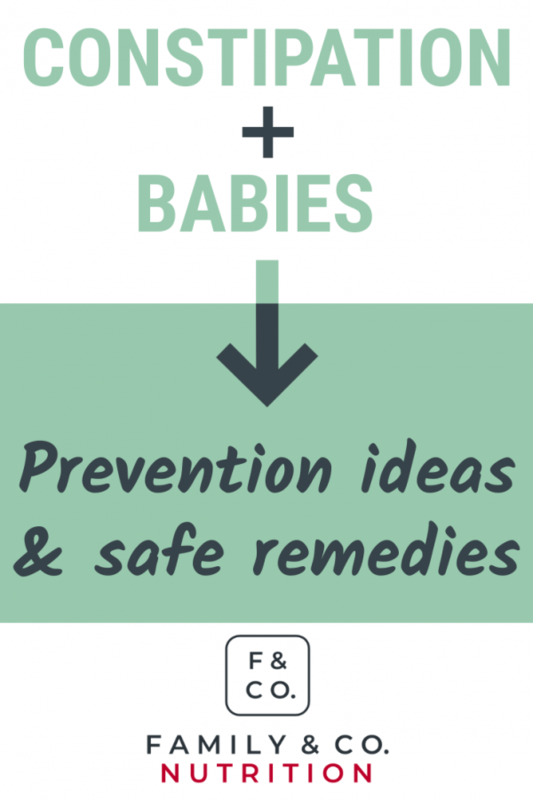 They have provided evidence-based guidelines for healthcare practitioners to follow when working with infant and children. 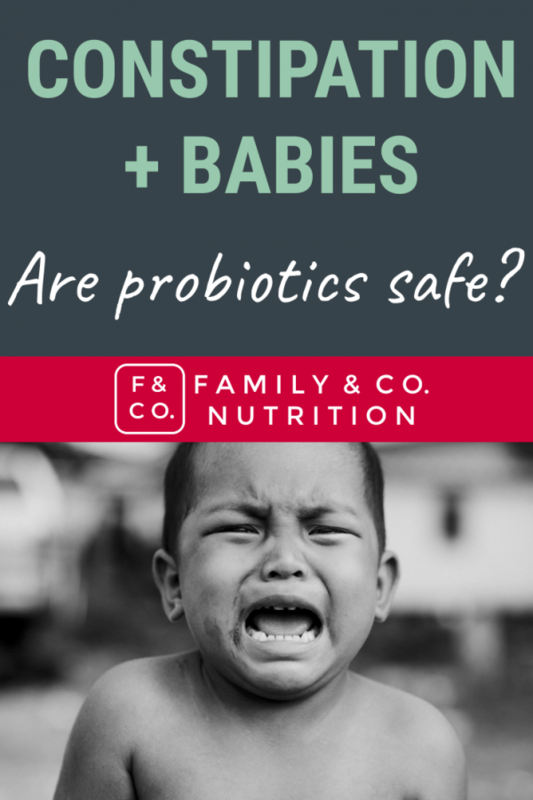 Based on their latest recommendations published in 2018, they DO NOT recommend the use of probiotics for infant constipation treatment. We recommend to see your doctor before trying any over-the-counter (OTC) treatment for your baby. Your baby’s digestive system is still maturing and more delicate than an adult’s one. Some laxative and remedies can harm your baby if not administered properly, so guidance from your trusted doctor is important. You know your baby best. If you feel it gets worst or you have concerns, don’t hesitate to see your doctor or registered dietitian for help. Yes, we are also here to help, so don’t hesitate to reach out! 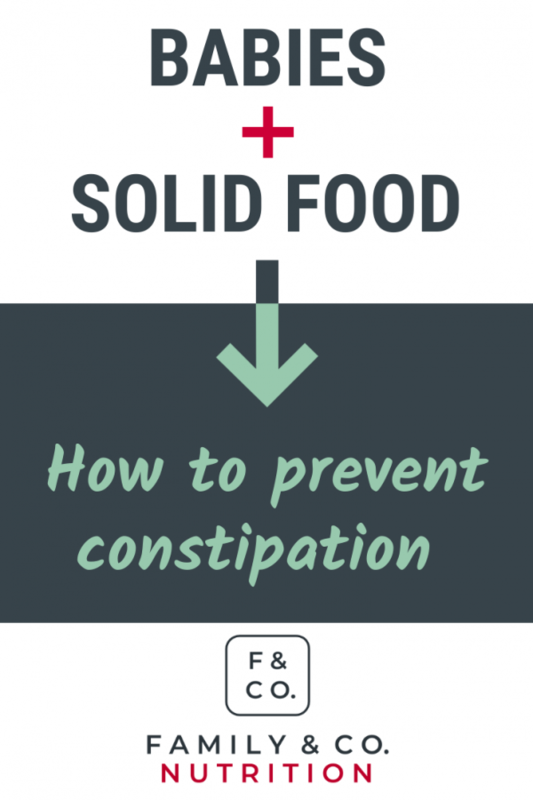 It is easier to prevent constipation than to treat it. Refer to your doctor to receive appropriate treatment for your baby. Bae SH. Diets for constipation. Pediatric gastroenterology, hepatology & nutrition. 2014 Dec 1;17(4):203-8. Tabbers MM, DiLorenzo C, Berger MY, Faure C, Langendam MW, Nurko S, Staiano A, Vandenplas Y, Benninga MA. Evaluation and treatment of functional constipation in infants and children: evidence-based recommendations from ESPGHAN and NASPGHAN. Journal of pediatric gastroenterology and nutrition. 2014 Feb 1;58(2):258-74.